Safe drinking water is fundamental to life. Fluence has more than 30 years of experience in making water safe. Fluence uses its proprietary technologies to provide decentralized, standard, and custom-designed water treatment solutions that can reliably deliver safe drinking water to municipalities and government entities, and high-quality process water – including ultrapure water – to industries. Our plants are fully automated and are controlled by our innovative Smart Operation suite, which enables real-time monitoring and response, and optimization of operating costs. Whether you need drinking water for a community or process water for an industrial facility, Fluence has a sustainable solution for your operation. As well as large-scale water treatment plants, we specialize in decentralized water solutions that are modular, scalable, and quick to deploy. Contact our experts to discuss your specific project details, and learn how our water treatment solutions can help you meet your goals. At Fluence, our engineers have developed some of the most efficient and cost-effective water treatment technologies on the market. Here are a few highlights. Fluence’s NIROBOX™ is a state-of-the-art, plug-and-play water treatment plant housed in a standard 40-foot shipping container. 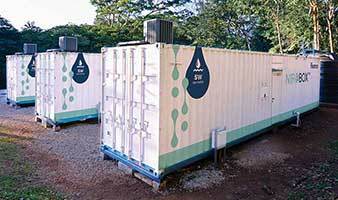 It’s designed to supply high-quality drinking water or process water from any source. Our Nirobox product line is standardized for brackish and seawater desalination, or treatment of surface water. The boxes have been designed to maximize production capacity with a minimal footprint, and to have low operation and maintenance requirements. Fluence’s Nirobox is the most cost-effective solution to meet communities’ or businesses’ drinking water or process water needs. Fluence has expertise in implementing biological treatment for potabilization. Biological treatments use particular nonpathogenic microorganisms for the removal of methane, ammonia, iron, and manganese, and use oxygen instead of chlorine or other chemical oxidizing reagents. Biological processes have zero environmental impact and low operating costs, and do not produce harmful byproducts such as trihalomethanes. Traditional treatment uses chlorine-based oxidizers, followed by sand filtration. This process, however, can lead to the formation of carcinogenic chlorine derivatives and requires costly activated carbon filtration. On the other hand, biological potabilization is a simple process that produces no undesired byproducts. It’s a solution that we’ve provided to dozens of customers around the world. Water can be processed to obtain demineralized or ultrapure water, suitable for industrial applications such as boiler feeds or cooling towers, or any use specific to the client production process. Fluence has more than 30 years of experience in developing solutions to produce highly dependable, fit-for-purpose industrial water. This includes resin demineralization solutions for industrial applications. We were among the first to apply the Bayer®-patented fluidized bed system in Italy. Fluence has experience and expertise in the construction of dependable demineralization plants, which are designed to operate 24 hours a day, 365 days a year, without unscheduled stops. Chile’s stringent environmental regulations require existing coal-fired power plants to reduce emissions, a power plant in the Atacama desert needed a reliable source of water to supply its new FGD system. 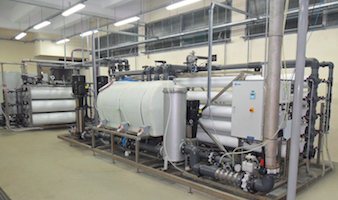 Fluence was contracted to provide a seawater desalination (SWRO) plant that produces 2,400 m3/d of fresh water to effectively operate the plant. Due to an ongoing drought, a beach resort, golf course, and spa in Costa Rica was facing water scarcity. It needed a solution with a high recovery rate that featured low energy consumption and minimal use of chemicals. The system had to be quiet, have a small physical footprint, and a low ecological impact. 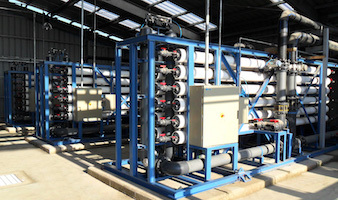 Three Nirobox™ units were installed, with a total treatment capacity of approximately 1,500 m3/d, providing disc filtration, ultrafiltration, SWRO, and remineralization to drinking-water quality. The system was started up only eight months after it was ordered, with a plan to gradually increase reliance on the system with the approach of tourist season. A power plant in Argentina needed to increase production of demineralized process water and lower operating costs. The goal was to replace its ion exchange treatment with reverse osmosis (RO), but the quality of feed water from a local river was too poor. We added an ultrafiltration (UF) step that allowed for successful reverse osmosis, leading to a reduction in operating expenses.